How I made 520 eCommece sales that generated $41,254.34 in revenue from $775.50 in ad spend with Pinterest Advertising. This funnel is not just for Pinterest ads. We are using it on Facebook and Google as well. It’s the best funnel we’ve ever created for direct response advertising to an eCommerce store. Hi, Im Ezra (that’s me holding a baby) and this is The story of how I made 520 eCommece sales that generated $41,254.34 in revenue from $775.50 in ad spend with Pinterest Advertising. September 19th, 2013, was shaping up to be just another average Thursday until … Pinterest, the world’s fourth largest social network, announced the impending roll out of their advertising platform. At that point, I’d already had my eye on them for quite some time. With warp-speed growth, a user base of 70% women, and an average user household income of over $100,000, Pinterest was shaping up to be an eCommerce marketer’s dream! I mean, c’mon! The whole point of Pinterest is for users to search and make lists (boards) of the things they want. For an eCommerce retailer, there’s nothing better than that: a large group of people with disposable income telling you exactly what they want by searching for it. I knew it was only a matter of time before Pinterest monetized their platform by letting advertisers display messages to their users. Pinterest Launched An Ad Network! Businesswoman pulling blank bannerAs you can imagine, I was STOKED when I heard that Pinterest ads were finally here! I was even more excited when I found out the ad platform was going to be a combination of query based visibility (read: people seeing ads based on what they’ve searched — a la Google) AND contextual visibility (read: people seeing ads based on demographic data points like age and gender — a la Facebook). Unfortunately for me, Pinterest was only letting in a few fortune 500 retailers to test, so I was going to have to wait. Disappointed as I was, I didn’t let it get me down; the eCommerce business is a long game where patience and consistency pay dividends, and I’ve been playing for a while. I remember when Google Adwords were 3 cents a click; I remember when Facebook launched and we were able to generate full price eCommerce sales for under $5 each. If you’ve been in the game a while, you may have noticed there’s a pattern with the launch of these social ad networks: traffic starts off cheap and gradually gets more expensive. This has to do with targeting. When a new platform launches, they are still working out the kinks in the system and dialing in its targeting capabilities and platform functionality, so ads are cheap. As they hone the targeting and tracking, it becomes easier to show advertisers a positive return on ad spend, and as a result ad prices go up. Basically, new social ad networks use cheap ads to attract advertisers as paying beta testers for their fledgling platforms. Win-win! pinterest-promoted-pins-1024x437Okay, now back to my story. Fast forward to the big news of early 2014: Pinterest opened a waitlist! You’d better believe I jumped on that thing QUICK. I’d already seen several case studies they had released with data from the lucky few Fortune 500 brands that got access right off the bat in 2013. The results were phenomenal: I’m talking SIGNIFICANT ROI. At this point, I was chomping at the bit to get my campaign going! Screenshot 2015-03-04 14.37.36All my excitement was for naught; they left me out in the rain for 9 whole months! But then one day I received the email I was beginning to feel would never come. I felt like Charlie with one of Wonka’s golden tickets. I WAS IN!! The party had officially started. *Note, you won’t have to wait this long to get access, as they are opening up more accounts every day. I applied for another business and was approved in less than a month. I was Like A Kid In A Candy Shop! I was like a kid in a candy shop as I began to check out their system. Sure enough, it was query based targeting combined with contextual data points. This means I get to choose the keywords for which I want my ads to show up AND I can set location, language, gender, and a couple other contextual data points. And on top of all of this, Pinterest is a native advertising system! Translation: the advertisement blends in with the platform so that the user can’t easily tell the difference between an ad unit or paid placement and any other piece of content on the platform. At this point, I was BEYOND STOKED! How was I going to use this platform? What sales funnel should I test? Should we just send people directly to our eCommerce product detail page? How much was it going to cost? And the list went on . . .
My go-to sales funnel for this type of situation — creating a new ad campaign on a new platform — is a lead generation funnel. This is where you use your advertisement (in this case a promoted pin) to send someone to a page where your only goal is get their email address (generate a lead). These pages can be social contests like raffles, giveaways, photo contests, etc. that require an email address to enter; or free PDF, Infographic, or e-Book downloads where the user must enter their email address to access the content; or even just a page with a promise of something on the next page, for example: “Get this free video that teaches you the 5 step process to a better golf swing by entering your email address below.” You get the picture. It’s just like it sounds; the goal of a lead generation campaign is to generate a list of leads. I LOVE lead generation campaigns for several reasons. They provide quick insight into how much traffic (clicks) will cost on a new platform; they generate a list of subscribers that you can follow up with; they are easy to create. But, here’s the thing: lead generation campaigns have ONE GIANT PROBLEM. They don’t make you any money! Of course, you can create an automated sales sequence that follows up with your prospects and turns them into customers by sending them content, offers, webinar invites, and the like. But all of that takes time, energy, and effort — and since time is of the essence when engaging with a new platform, I decided NOT to use a lead generation campaign for my first promoted pin test. Instead, I used a traditional direct response advertising campaign, with the goal of generating customers right away. Direct response campaigns are a little simpler because the basic ones don’t require long-form follow up sequences. When I show you the funnel in a little while, you’ll see that I ended up doing a bit of follow up anyway, but first let me show you the results! I’ve Been Getting 17 Cent Clicks!! AB2Not only that, but the number of visitors I received from Pinterest ads is DOUBLE what Pinterest says they sent me, meaning I’m actually getting 9 cent clicks. As you can see, I’ve spent $775 from which I’ve generated $21,969 in revenue. I used a google analytics tracking URL in my promoted pin so I could track back exactly how many visits and sales came from Pinterest ads. We have not seen this level of high quality traffic since Google Adwords way back in 2003. It’s ridiculous! Here’s another interesting tidbit for you: the traffic I’m getting from Pinterest ads is spending nearly 3 times as much time on my web page as my Facebook ads traffic, and it’s converting 5 times better. You may be wondering why I said I made $41,254.34 in sales from $775 in spend but my analytics only shows $21,000. Well, here’s where it get’s really interesting. Take a look at my direct sales and Google organic sales; I had NO direct traffic or Google organic traffic before I turned on this campaign. None. Zero. Nada. Now I’m getting 5-10 sales per day from each source. This means people are seeing my ad, remembering it, and then coming back later to search for me and buy from me. Compare these stats from before and after I turned on the campaign for Pinterest. In the month before I had ZERO traffic and sales. In the month after I have TONS of traffic and sales! So what was the direct response funnel I used? How did I actually do this? Hint: I did not send people form Pinterest directly to my website. Instead, I sent people from a promoted pin to an article engaging them in a story about my brand and products. From there, the interested prospects clicked through to my eCommerce store. My results I’ve just shared with you tell me that this traffic source is EXTREMELY powerful. There’s a HUGE opportunity here for eCommerce retailers. The Pinterest ads network is just starting out, and its only going to get bigger and more robust. If Facebook and Google are any indicators (and they usually are) we have a year or two of extremely cheap, high quality traffic in front of us before Pinterest gets to be any kind of competitive (read: expensive). can’t wait to share what I’ve discovered with you. 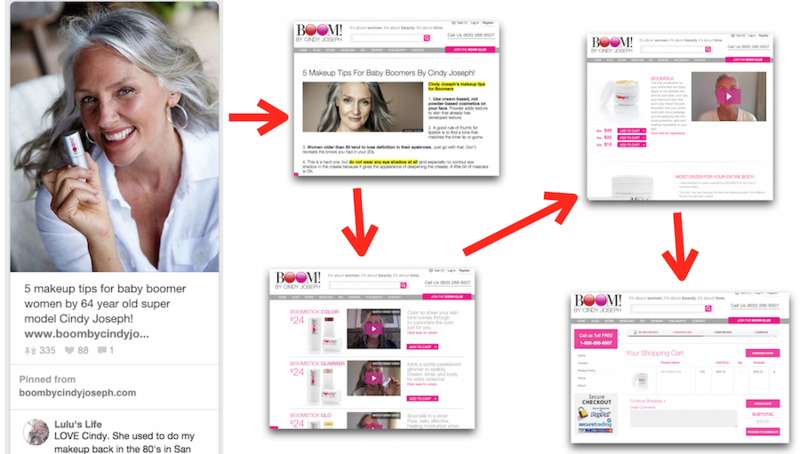 Oh, and I should mention: this funnel is not just for Pinterest ads. We are using it on Facebook and Google as well. 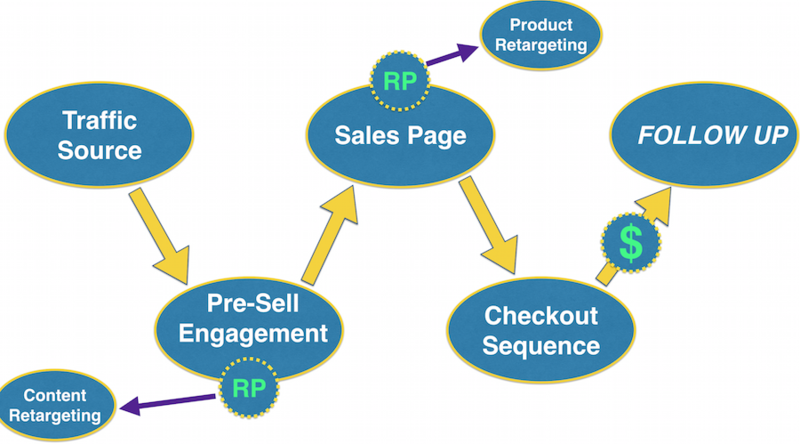 It’s the best funnel we’ve ever created for direct response advertising to an eCommerce store. Serve the world unselfishly and profit!